The basset hound comes from as far back as the 1500s when the pre-revolutionary French were using low slung, heavy-bodied hounds to trail rabbits. The word “bas” is French for “low” befitting the basset hound’s stature. A number of the short, bowlegged French hunting dogs and the basset hound we recognize today were fine-tuned in England in the 1800s. With the exception of height and leg conformation, they are similar to the St. Hubert’s hound. 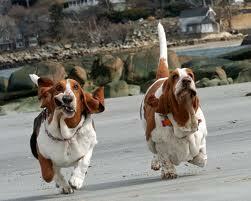 In the United States, the Basset quickly moved on from hunting dog to family pet. Familiarized to the public by cartoons, such as “Fred the Basset,” and in commercials, such as Hush Puppies™ shoes, the basset hound is now primarily a companion dog.